One of my chronic organizational challenges used to be what to do with my pattern pieces after I've gone and used them. Never mind the impossible task of folding tissue papers into neat little envelopes (nearly hopeless for me), but the Ottobre issues with not only large pattern sheets of un-moored from the magazine plus the traced tissue copies in multiple sizes as my kids grow and my own drafted pattern pieces which are large and unwieldy bits of paper architecture laugh in the face of filing cabinets. What to do to store these so that they not only stay neat but also can be easily found? Enter industrial paper clips and hangers. My sewing storage at one point found itself a home in a clothes closet, where a system of hanging up my groups of pattern pieces evolved. I find it especially helpful to organize my ongoing pattern revisions and master copies of my own pattern drafts. It's also quite handy to hang up bits of intended fabric and matching thread in plastic bags for when I plan out a project and gather supplies but have to put it aside for a bit. Currently my pattern pieces are sharing a closet with my husband's clothes. I have only a few patterns right now, having just moved here, but I imagine by the time summer rolls around I shall have taken over a significant amount of storage real estate. 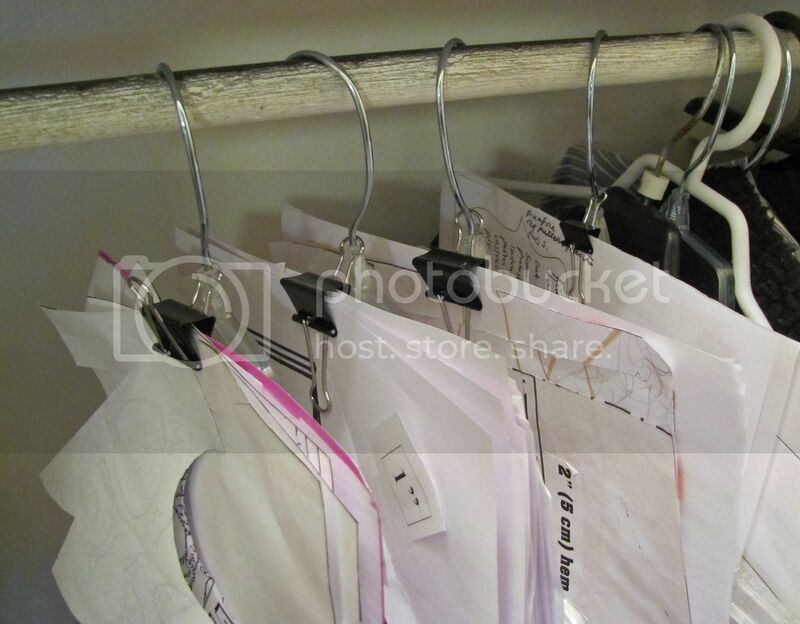 When it's time to move again, I will pull all the paper clips off the hangers and lay them flat between a couple of protective sheets of cardboard. Ready for a new closet. How do you store your patterns? I put everything into a large Ziploc bag, with the picture/name of the fabric in front. Right now I have them in a milk crate type of container. I've been wondering this same thing lately. I read one suggestion of a binder with clear protective sheets that you could slide the pattern pieces into. They're bigger than the pattern envelopes, but still keeps everything semi-condensed. I think I'm going to try that route. I was thinking of this lately too!! (funnily enough with some of your patterns ;)) I use paper lunch bags for the pattern pieces using multiple bags for each size and staple that to the instuctions. If its a commercial pattern i just write the pattern number and keep it with the original package. They are all kept in an old record shelf. I really like your idea of bags for fabric though, i may adopt and adapt it!! I know it won't last, but for now I use a big file box with the hanging file folders, they are categorized into types of patterns, men/women/kids, accessories, toys, diapers, and stuff like that. It's already getting kinda full though :) so I know it won't last forever! I do the binders with the clear plastic sheets as pockets. I use this for store bought patterns, pdf pages, and things I've made myself with Target ads (the best pattern paper, actually!). For patterns I make often, each size gets it's own plastic sleeve, so I can easily flip to what I want and see what's in each sleeve without opening it. I use the binder with sheet protectors too and love it. I also keep a stash of tissue paper in the front page protector for easy access to trace a particular size or to sketch out a pattern. I have mine three different ways. Some, like Burda Mag patterns and Japanses book patterns are in a regular folder. Traced patterns ans some printed from burda online are in an expanding file folder and the ones I'm working on currently (or soon) are binder clipped together and hanging from a thumb tack stuck in the wall. Funny! I just organized my patterns (took me two days to get everything neatened out and separated by size - ugh) and I used those clips on some of them, then put them in an old gift bag. Others that I traced onto recycled acetate (which, though nice for patterns, won't hold a crease) get shoved into ziplock bags. I love the idea of hanging them up, though. I put them in expandable file organizer. Currently have 1 file each for my DD's patterns, sister's patterns, my patterns, for saree blouse drafts of entire family! 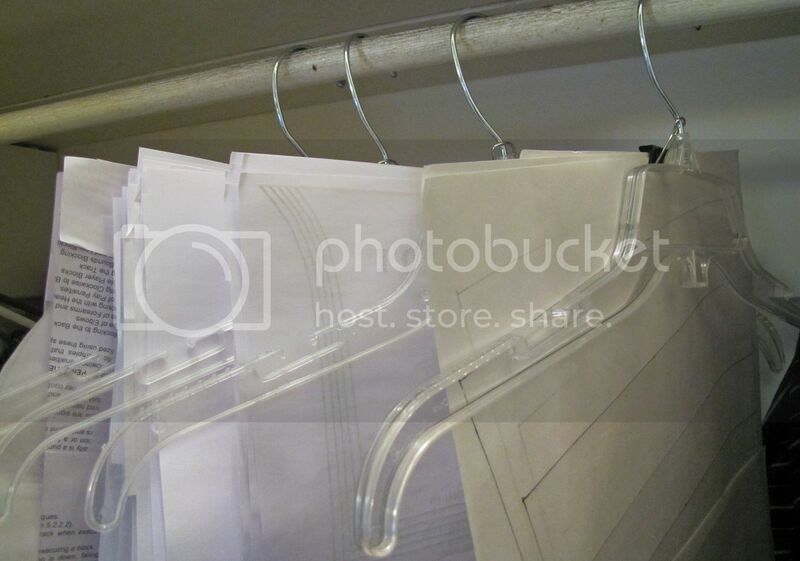 I keep all mine in alphabetic order in plastic protector sheets in a 3-ring binder. I keep a copy of the pattern instructions (including an un-cut copy of the pattern pieces, if it was a pdf pattern) and all the pattern pieces in each protector. I also have an expanding file with additional copies of the pattern pieces to swap as they get worn out. I store mine in gallon sized plastic bags with the zipper top. The pattern # written in the corner and what I have made with the pattern and size written on the memo part. I keep them in a diaper box, they fit perfectly on their side. what a great way to keep them all together. mine are in a folder, but they aren't that large. also- i use freezer paper for most of my clothes patterns. you can iron it onto the fabric instead of pinning to cut it out and it comes wide enough for whatever you need + length is where is you cut it! I have a similar system. I use those butterfly clips to attach all pattern pieces to the instructions, and if it's too large for the file folder then I put it into a large art portfolio. I think I like the hanger idea better though... might have to do some reorganization. That's a smart way to file them. I use ziplock bags. I keep the original pattern it it's envelope, in an old shoe box, and the traced pattern sits in a ziplock bag with the pattern name, number, view and size written on it on another box. I trace them because I can't bring myself to cut into a multisize pattern and destroy the other sizes. I would probably get one of those big art pouches (the ones with a zip round them) where you can store your paintings/sketches. That would be a fab way to store them all in one place. I put patterns in manilla folders (they don't have to be folded all of the way) and organize the manilla folders into hanging folders and in milk-crate file boxes. They fit on the shelf of my Ikea expedit book shelf. It works well for me. I can see everything at a glance. That's a great idea! I keep mine in hanging file folders in my file cabinet. Not the best scenario, but it works. This is awesome - I'm inspired! I love this organizing idea , right now my patterns are in zip lock bags and in big box, that every time I want one I have to empty it out to find one. UGH. I need something like this that would be easy to see the ones I use most often!! I use gallon baggies and they live in my crafty file cabinet where I store all things crafty that are flat-ish (We have a separate file cabinet for important stuff).